Thrill of the Taxa is a series where everyone's favorite hunter/behavioral ecologist Aukatos is going over hunter pets from a biological lens. With the introduction of tameable "feathermanes" in patch 7.2, we thought it would be fun to revisit the series looking at the new legion tameables. Hello again! A lot has happened in Azeroth since we last experienced the Thrill of the Taxa, looking in detail at how our pets resembled or differed from their real-life counterparts. Since we’ve already gone into the details of each taxonomic family, I won’t be discussing those so much as how the new families fit in to what we’ve already established. If you need a refresher, check out the other articles here: Mammals, Inverts, Archosaurs, and Reptiles. First, let’s just get it out of the way that the term Ox refers specifically to a domestic male bovine that’s been castrated (often synonymous with steer). So, by naming the family “Oxen”, Blizzard has basically given us “Cows” as a family. That being said, oxen (cattle) are mammals from the family Bovidae. This family encompasses many hoofed mammals, from our domesticated cattle to goats, from bison to antelope. In WoW, the Oxen family currently encompasses Yaks, Musken, and Shoveltusks. Yaks are pretty closely-related domestic cattle, so that makes sense. If I had to guess, Musken in-game are probably the Azerothian version of Muskox. However, if so, muskox are actually pretty far-removed taxonomically from oxen, being more closely related to goats and antelopes. Since we have goats as a family in-game, and talbuks in the stag family, this placement is a little farther-reaching. Shoveltusks are the last member of the Oxen family in-game, and are a little bit of a conundrum because they don’t really resemble any extant (currently-living) species. However, if we go back in time a little to the Cenozoic era, there are many incredible mammals that went extinct as the climate changed and humans moved across the world. Perhaps shoveltusks would be better placed with Brontotherium. What do you think? Mushan and Stegodons are clearly reptilian in appearance, with Stegodons being a direct derivative of Stegosaurus (and more akin to Archosaurs than current reptiles). Then we have Kodos, which have been a staple of WoW since 2004. Kodos appear to fit the outline of the other Scalehides on the surface, or perhaps another Cenozoic mammal, Megacerops. Regardless, Kodos are almost certainly mammals (See all the hair?) placed in a “family” with reptiles. I get the fantasy I suppose, but perhaps this warrants further clarification. Fig 1. A Shoveltusk (left) and a Wooly Kodo (right), compared to an artist’s depiction of a Cenozoic mammal, a Brontotherium (center). 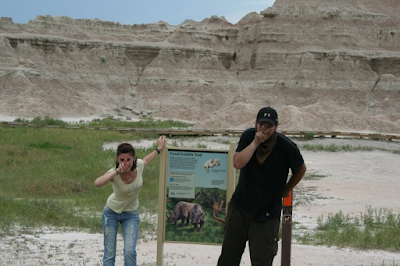 Delirium's Side Note: This my friend Kristin and I pretending to be Megacerops at a digsite-turned-national-park in South Dakota. I know, I know, we are awfully cool. 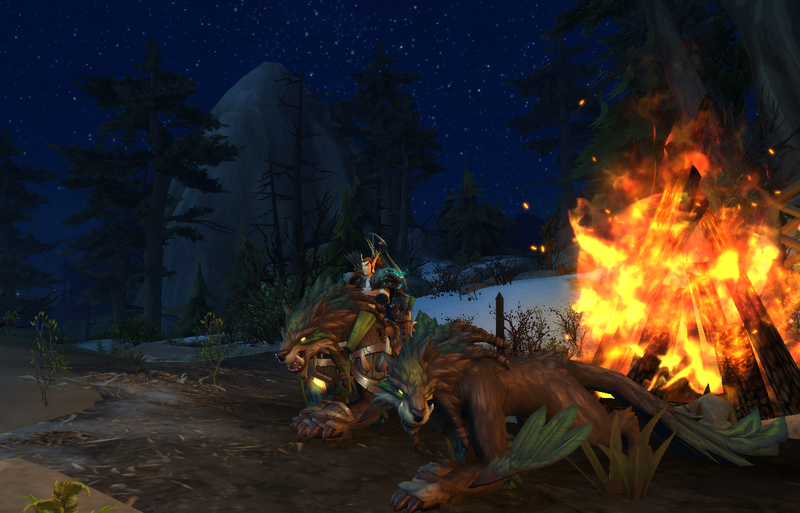 While the community hasn’t been exactly rabid for tameable gryphons and wyverns, these non-tameable beasts have been in the game since Vanilla, with nearly every expansion increasing their diversity. First, this is definitely another example of what we call a “junk taxa”. As a reminder, a junk taxa is a grouping of species that is likely taxonomically incorrect, but is established nonetheless because a better phylogeny hasn’t been proposed. So, while we have obviously very distantly-related species in this “Family”, there are a couple similarities: most are merger of two or more taxa, and most of these mergers are avian + mammal. The above are mostly a combination of two different animals (technically three with hippogryphs) with the exception of wyvern. Wyvern are likely mammalian in nature, and could almost be some bygone evolutionary split from bats if it wasn’t for the tail. If I had to settle on a combo, I’d say mammal + arachnid, as the tail is clearly related to a scorpion’s tail, even so far as to contain venom capable of putting its prey, or member of the opposing faction, to sleep. In other lore, wyverns are dragon-like creatures, which doesn’t match up with wind riders very well. Manticores, however, are a much better match. Manticores vary by local mythos, but at least some of them have the body of a lion, a human-like head, the tail of a scorpion, and the wings of a bat. If this were the case, instead of a merger of two animals, you would have a quad-species combo. Fig 2. Feathermanes! Griffins, Wyvern, Owlcats, and Hippogryphs are currently in-game as representatives of this family. Wolfhawks are coming soon, as Hunter class mounts. Let it be noted that Owlcats are just another step towards taming Druids. There is one big question surrounding Feathermanes: how did they come to exist? At the moment, the only clue we have related to the origin of Feathermanes is the very item used to tame them: Tome of the Hybrid Beast. Hybrid Kinship suggests an actual combination event of the involved species long ago. That’s not to say hybrids don’t occur naturally. In fact, hybridization between two (or more) species is not uncommon in nature, and happens across the entire spectrum of life. Plants can hybridize with similar plants, mammals can hybridize with similar mammals, and so on. However, the further away the taxa are, the more difficult it becomes to produce a viable offspring. Outside Azeroth, our own Earth has a stunning diversity of animal life, which comes in all kinds of crazy shapes and sizes. Around us, there exist actual animals that could represent something like these hybrid beasts we’re clamoring for. Let’s take a look at a couple categories of “hybrid” beasts: missing links and combination animals. What if we took a fish, and crossed it with an amphibian? If it had fins, and those fins had bones like our arms and legs, could move independently, and could support some weight, we'd have the Coelacanths, a relic of prehistoric times which are more closely-related to mammals than they are to most other fish. The fins of these fish are just as described above: less like fins and more like the limbs of an amphibian. Coelacanths are commonly called “living fossils” and are the last remnants of the group of fishes that were thought to have moved out of the water and evolved over time into amphibians. These are so rare, scientists thought they had gone extinct 66 MILLION years ago. Then, in 1938, a specimen was caught and the species was “brought back to life.” Crazy, huh!? What if we took a bird and crossed it with a reptile? Perhaps it would be mostly bird-like, but maybe with patches of bare, reptilian skin? Perhaps it would have not only scaled feet, but also claws on its wings to help it climb trees. Wouldn’t that be neat? As you might have guessed, I’ve been describing another living-fossil, the Hoatzin bird (pronounced ho-ah-tzen, or Watson). These crazy-looking birds are in a Family all their own, dating back to when dinosaurs roamed the earth. Perhaps the most striking physical feature of these birds can be best seen in the chicks – young Hoatzins have claws on their wings, like many of the prehistoric birds did, that help them climb back into the nest when they fall out. The claws recede as the wing develops, until they’re mature enough to fly. Fig 3. Real-life missing links! Both of these crazy creatures, the coelacanth (left) and Hoatzin birds (right), are real and still exist today! Of special note, the Hoatzin chicks (far right) have claws on their wings, not too unlike some Archosaurs we’ve looked at previously. Perhaps the most well-known crazy cluster of an animal is the platypus. When you take an otter, and cross it with a duck, you’ve got this Austrialian species. Platypuses are taxonomically distinct from all other mammals, with marsupials being their closest relatives. Evolutionary grab-bag appearance aside, there are a couple of really interesting fact about platypuses: they lay eggs; they hunt by detecting the faint electricity produced by the bodies of their prey; males have venomous spurs that can be incredibly painful to humans. If you took an armadillo and crossed it with an anteater, and taught it to climb trees, you'd get the Pangolin. These little armored mammals eat primarily ants and termites, and can roll up in balls covered in hard scales which can protect them from predators. Even lions have a hard time breaking through a pangolin’s armor. What if we crossed a kangaroo with a rabbit, then crossed that cross with a mouse? Can you guess what it looks like? Look no further than the Jerboa! These tiny mice are just as described. These tiny rodents hop around on their kangaroo-like legs, and can reach speeds of about 15mph! Not bad for something that can fit in the palm of your hand. Being primarily nocturnal, they use their large rabbit-like ears for detecting predators, and sometimes hunting for (tiny) prey. Jerboas are native to Asia and Africa, and are not to be confused with the kangaroo mice we have in southern United States. Fig 4. The platypus (left), the pangolin (middle), and jerboa (right), are just a sampling of the oddities of our world.